Unlike Russia, South Korea put politics before business at the EEF. The South Korean President’s visit to the Eastern Economic Forum (EEF) has left a mixed impression. While Korean businessmen indicated that they were ready to invest in Russia, Park Geun-hye paid more attention to the North Korean nuclear problem than business matters. 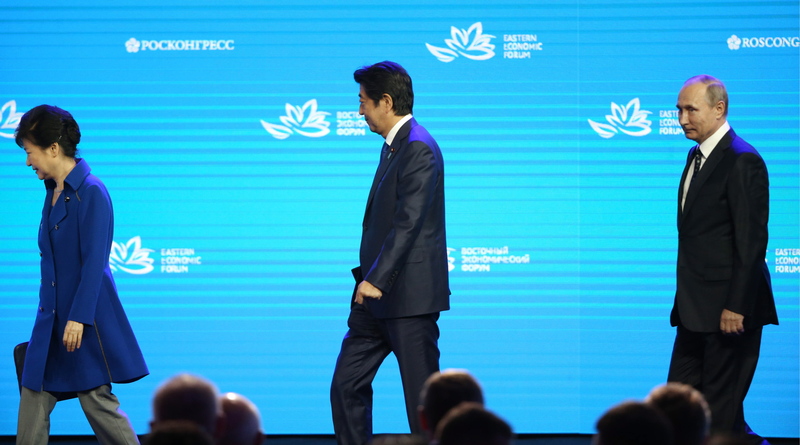 In comparison, Japanese Prime Minister Shinzo Abe, who called for an unprecedented level of cooperation with Russia and promised to sign a peace treaty, has left a more favorable impression. South Korean President Park Geun-hye spoke twice at the just-concluded Eastern Economic Forum (EEF): the first time at the Russian-Korean dialogue (her address was not announced in advance and therefore may have been spontaneous) and then at the main plenary session together with Russian President Vladimir Putin and Japanese Prime Minister Shinzo Abe. On both occasions, Park began with recognizing the potential the Russian Far East has for the development of the region’s economy. “The Far East is a treasure trove of resources, a transport hub, a new heart of Russia,” she said. Park promised that South Korea would invest in setting up shipyards, assist in logistics, waste recycling, and pharmaceuticals among other things. She added that South Korea would revive bilateral projects that were discussed back in 2013 and would work towards a free trade agreement with the Eurasian Economic Union (EAEU). However, both speeches ultimately boiled down to appeals to Russia to use its channels of communication with the North Korean leadership to stop that country’s nuclear program. “Because of constant acts of provocation from North Korea, trilateral projects, including Hasan-Rajin, are faced with difficulties. […] If these difficulties are removed, the projects will be implemented,” Park said. According to Park, “peace and stability in the region is a guarantee of economic relations” and “if we fail to prevent North Korea’s nuclear program, there can be no talk of economic development”. In his reply to Park’s speech, Putin assured her that Russia’s principled commitment to nuclear nonproliferation remains unchanged. “At the same time, we believe that North Korea should not be provoked, it should be brought back to the negotiating table,” Putin said. “President Park knows that we still have communication channels [with Pyongyang] and we shall try to help relieve the severity of the situation.” Putin added that Russia and South Korea “should use every opportunity and do everything to return to the joint projects”. In an interview with RBTH ahead of the EEF, Russian presidential envoy for the Far East Yuri Trutnev said that some South Korean companies were hampering bilateral projects with Russia. Compared to Japan’s strong delegation, the contingent from South Korea looked considerably smaller. The business dialogue sessions were held in the same hall on two different days and during the Korea session, half of the seats in the hall were empty and Korean speakers failed to present any breakthrough ideas or a strategy capable of competing with Abe’s 8-point economic plan. Russian Deputy Minister of Economic Development Stanislav Voskresensky said that in 2015, South Korea was Russia’s 20th largest trade partner, falling behind after both China and Japan. As for a free trade agreement between the EAEU and South Korea that President Park mentioned, a bilateral commission is currently studying its possible advantages. Its findings should be presented in December 2016. In her speech at the Vladivostok forum, EAEU Trade Minister Veronika Nikishina hinted that the decision on starting free trade agreement talks “would depend on whether the Korean side had an interest in investing in the markets of EAEU member states”. A source familiar with the talks told RBTH this statement indicates an interest on the part of EAEU member states for a more comprehensive agreement, rather than just a simple reduction of customs tariffs: something like Abe’s eight-point plan, for example.